Full donation totals will be up in due time. - Eric, Ben, Mike, Kyle and anyone else who braved the cold and installed the course. -Eric, Ben & Geoff for the additional baskets. - Dan & Sam for attempting to boost my car in the frigid weather. - Geoff for being a great liaison between me and Daredevil discs and more importantly for waiting around until my car got boosted. - Daredevil discs for putting out a great product that is suited for seasonal play. - Serge for the trophy's and for donating the candles. -Eric Vinet for running a fundraiser at his workplace and raising a nice wad of bills for the OFB. Bravo Mr.V. - The Ultimate Disc Golf Store who always seems to come through with prizes as well as a food donation. - Amanda for helping the new kid on the block....er kitchen. - Everyone who showed up to play in some seriously frigid weather. It's safe to say we were pushing the envelope on rule #1. 1. 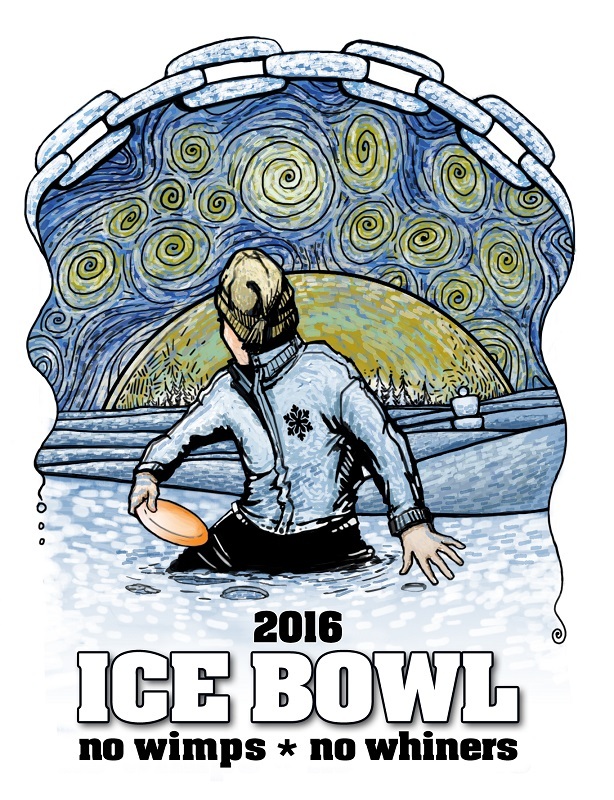 Under no circumstances, may an Ice Bowl� be cancelled or postponed because of weather conditions. And thank you Andros, Serge and Eric for making this happen. It is too bad you all did not get to play this course in more comfortable conditions and it is a dreamy winter layout. With all this new snow there is a group of us playing often. This Friday (Feb. 19th) will be the next big round. Tee time 8:30pm. Text six one three eight five zero six five two nine if you want to join in the "fun". Downtown layout. I would like to add thanks to those who took a few minutes at the end to help clean up. Not sure if we rented the room or not, but leaving it in a clean state bodes well for us if we want to do this here again next year (or for any thoughts of something more permanent).